We’re still rolling through the January J-List shopping spree and this week’s tasty treat is gum. There have been several gums already reviewed at the JSFR, some good some bad, but I’m always willing to try new flavors. Thus, when I saw Double Caramel gum I was intrigued; mostly because I had no idea what double caramel would taste like versus single caramel. There’s only one way to find out though, and on the list it went. I’m guessing that double caramel is a milk caramel and a toasted darker caramel, given the construction of the gum. Also, is that not an awesome look? I really dig the look of the chocolaty outer layer wrapped around a buff caramelly inner blob. The gum packaging itself is also quite cool having a sliding drawer for all the gum pieces to sit in. As far as taste, this gum is indeed caramel flavored. You can definitely taste the milk caramelly goodness of a decent Kraft/Brach’s like caramel. There is also another darker, toastier flavor that we can’t quite pin down. It’s somewhat molassesy without the characteristic molasses bite. Perhaps it’s a dark, dark, (dark) brown sugar taste. Whatever it is, I am assuming it’s the second caramel flavor and it’s not bad. The chew is initially really sweet and very flavorful but it dies down to a mellow mingled caramel flavor once you’ve chewed through the sugary bits of the gum. The mellow caramel does last for a decent time so that’s a plus. The texture of the gum is also pleasant; not too hard but not ridiculously soft either. 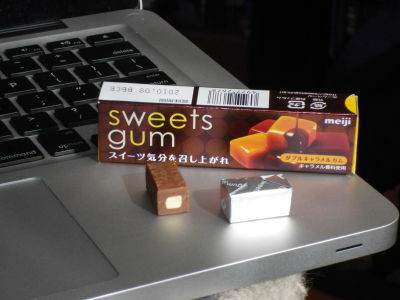 Caramel is perhaps not the most ubiquitous gum flavor but in this gum Meiji gets it right. Rating of 4 Wasabi Peas out of a possible 5.